Three players compete. 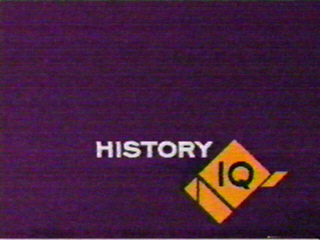 In the first round "Eye Q", the contestants are shown a short video clip about a historical figure or event, and are asked a question about the clip. The player who buzzes in and answers correctly wins $100 and gets control of a series of follow-up questions on the same subject. Each right answer wins $50, but if the player answers incorrectly the other two can buzz in and steal control. A total of four clips are played; at the end of the round, the third place player is eliminated. In the second round "Tri Q", the two remaining players are shown a series of lists, each with three items. Host Summers asks a question; the player who buzzes in and correctly identifies the right answer from the list wins $200 and has control of a $100 toss-up question which s/he may play or pass to his/her opponent. Wrong answers in this round deduct the value of the question from the player's score. The second round culminates in a 45-second speed round with one final list, each right answer being worth $100. At the end of the round, the player with the most money wins the game and heads on to the bonus round. For the second season, the first round was changed considerably. This time around, the three players are shown a headline from the past, shown three facts about the event, and the contestants have chime in and pick the incorrect fact for $100 (but will cost $100 if wrong). If correct, the player gets a follow-up question for +/-$50. Two to three headlines are played in each category, four categories are played during the round. The player is presented with 10 headlines from 10 consecutive years, and has 60 seconds to assign the headlines to their correct years, using a touch screen to place the headlines in their respective years. Along the way, the player can use one of five "Hot Buttons" to see how many headlines are correctly placed. After time runs out, each correctly placed headline wins $500; having all 10 in the right order wins $25,000. During the second season, the timeline was played slightly differently. A headline would appear at the top of the screen, and the player would try to place that headline in the correct year. If the year was right, the headline would remain there; otherwise, it would reappear at the top to be replaced. Getting all 10 headlines in 60 seconds won $5000; no money was won if the player failed. Winners of the front game during the second season advanced in a tournament, whose eventual champion wins $250,000. One of the better shows to come out of 2000, certainly the most cerebral. The set and music convey a nice, spacey atmosphere to the show, and the tangram-like graphics add to the abstraction. Marc Summers seems right at home, which should be no surprise since he's surrounded by the same production staff that did Double Dare way back when. The only problem with the first season was the touchscreen which was used during the Timeline round, which a lot of players had trouble with. The second season changed the format a little, but not necessarily for the better. The Timeline round is somewhat easier and not as much of a hassle for the contestants, but the first round lost all of its charm. I enjoyed watching the little video clips and thought the element of keeping control until a miss was a good one; I can't imagine why they changed it. I did like the addition of a studio audience, though. Toss-up: March 15, or "The Ides of March"